This week, the Katuaq Cultural Centre of Greenland in Nuuk celebrates its 20th anniversary. When opened in 1997 the building provided for the first time a cultural and artistic meeting place for both locals, the international Inuit community and visitors from all over the world. Built to last and survive Greenland’s unforgiving climate, the cultural centre still stands today as a dynamic meeting point catering for a diversity of activities from concerts, cinema, theatre performances, conferences, exhibitions to public events. In 1992 Schmidt Hammer Lassen won the international design competition ahead of 226 proposals, with a concept inspired by the dramatic Greenlandic landscape of winding fjords moving glaciers, icebergs and in winter the inspiring, undulating northern lights. Katuaq Cultural Centre reflects these elements: the surging, bright, timber-clad façade, with its luminous skylight symbolizes the northern lights – the triangular, monolithic dark body of the building represents the iceberg – the interior bright, white foyer space with its independent volumes of theatre, cinema and café reminiscence the spatiality of the fjords and mountains, snow and ice. 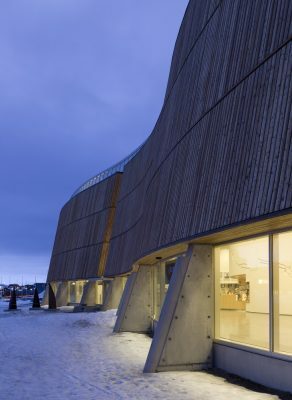 With its organic, natural, appearance the building hit directly into the soul of the Greenlandic people and it has managed to gather Greenlanders from all age groups and interests bringing a sense of ownership that reaches deep into society even today, 20 years later. 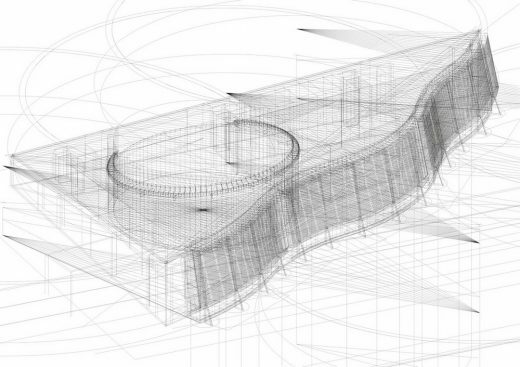 “Winning the competition to design the Cultural Centre in Greenland was a major breakthrough for our studio as our first project on an international scale. It spearheaded our architectural ambition to create cultural buildings with a strong sense of place and a space that acts as a meeting place for people,” says Founding Partner Morten Schmidt. “The challenge of constructing a sustainable building that could withstand the arctic climate conditions also brought us new knowledge about which materials we should use”. Since its opening Katuaq has been a popular space embraced by not just its capital citizens but Greenlanders from all parts of the country. The annual visitor number of 100,000 (Greenland has a population of approx. 56,500) is reflecting the dynamic activity and cultural programme of the centre but also the fact, that these events are regularly broadcast from the TV studio designed for the building. Bringing the Inuit culture to every home, the Katuaq building has become an icon for the Greenlandic community and beyond, spreading as far as Canada, Alaska and Russia. 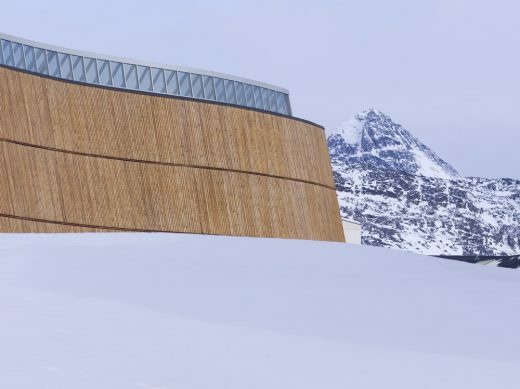 Katuaq Cultural Centre of Greenland has been awarded the Selected Buildings Award, 1997/ The Nykredit Architecture Prize, 1998/ The Danish Arts Foundation Award, 1998/ and The Eckersberg Medal, 1999.